I was so excited during my recent visit to Gatlinburg, Tennessee to see this storefront display! You don’t have to go to Gatlinburg to find these cute shirts. You can buy them online! Check out my post about Simply Southern/It’s a Girl Thing here or shop from the picture below! This post contains my affiliate link. You can read my full policy here. It’s almost July! That is the time of year around here when I start buying Christmas gifts and putting them away. 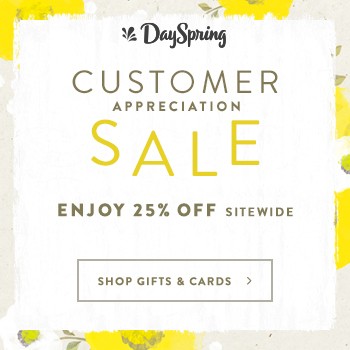 Dayspring has cards, gifts, crosses, clothing, home decor and many other items online. Right now, the entire site is 25% off with the code THANKYOU! Click below to check them out! This post contains my affiliate link. You can find more information here. I haven’t seen the new Finding Dory movie but I love the line from the first one that says to keep on swimming. I use it often around here when we just need to keep doing some repetitive thing in order to get to the end. Keep going! On our last night there, we left the little girls with the grandparents and had our 17 year old with us. He wanted to walk the strip and see the shops. It was fun but by the time we got started it was 10:15 and we had already had a full day. We did not stay in a hotel on the “strip” but had to do quite a trek up a side street to get to our room. Needless to say, we were dragging by the time we got to our street and started up our hill around midnight. About half way up we all just laughed because it seemed that the hotel had been moved. It was still easily in the high 80’s and we were all sweaty and tired from the day. We made those last few steps easier by talking of how great a shower was going to be! Eventually we made it to the top and looked back down toward the street. I snapped this blurry picture. The thought came to me that this scenario was a lot like life. You just keep going, one foot in front of the other, and eventually you get to the top. You just have to keep it up to persevere. A little at a time. Many things in my life have felt like that hill. A divorce. Sickness. Financial Hardships. Anxiety. When I’m in the middle of them, I just can’t see the end in sight. It seems that the “hotel has been moved” and I’m trudging along and not seeing clear progress. But guess what, during every situation, I came out on the other side! I reached the top and looked around! And it was often beautiful! Here’s a stone tower my son made when we reached one point on our river and rock climbing day. The picture makes it look small but it was about 3 ft tall. No matter where our life’s journey takes us, we do always leave a little piece of ourselves there. If you’re going through a tough time right now, you just keep going too. You’ll reach the top soon! You might be a little sore but you’ll be thankful for the journey! Just keep putting one foot in front of the other. Little by little, you’ll make your way!